“Daddy’d light up his cigarette, saw his fiddle, pluck the strings then tune a bit. Tell a story of days gone by…” These lyrics from “Blue Ridge Mountain Lullaby,” written by Appalachian songwriter Martha Spencer, are born from her own life growing up in the hills as the daughter of world-renowned traditional stringband musicians. Spencer’s self-titled album, due out October 26, 2018, is rife with these evocative visions of Appalachian mountain music and culture, each song painting a picture of the deep heartland of American music. But this is no exercise in nostalgia. Spencer’s got as keen an ear as a songwriter for the vagaries of romance (“My Heart Says Yes”, “Cold Winter Lingers On”), as for the position of women in the world (“Hard Headed Woman”), drawing often from the rural environment she was raised in to create metaphors. This is an album that touches as much on honky-tonk or old-style country roots as it does stringband music, even at times approaching the blues. This kind of blending is as natural to Spencer as can be, since the Appalachian Mountains have always been the key locus point that wove together the many strands of American music into the tapestry we know today. 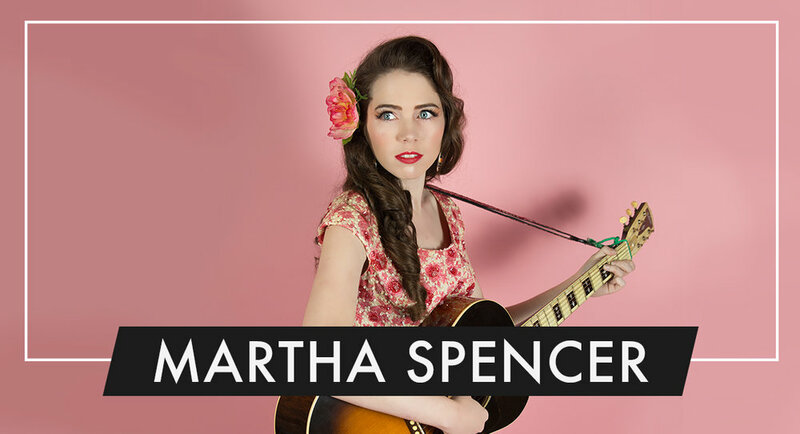 Born and raised in the Blue Ridge Mountains of Virginia, Martha Spencer grew up surrounded by mountain music via her parents, Thornton and Emily Spencer. Spencer joined the family’s famed Whitetop Mountain Band at a remarkably young age, flatfooting and singing. Originally formed by her uncle in the 1940s, the Whitetop Mountain Band toured all across the United States, was featured at the Smithsonian Folklife Festival, and traveled overseas. They played music born from the old Scots-Irish ballads originally brought to Appalachia and the rough and tumble square dance music of the region, and Spencer joined in from a young age on multiple instruments (guitar, banjo, fiddle, and bass). With her first solo album, she’s carrying a hundred years of tradition on her back, but doesn’t seem weighed down by any of it. Her music is joyous, sparkling with raw energy and the deep clarity of a mountain stream. Joined by friends, neighbors, and colleagues on the album, she’s assembled a who’s-who of Appalachian artists. Spencer’s frequent musical partner Frank Rische (Lillie Mae) guests on the most tracks, playing guitar, bass, and singing harmonies. Spencer’s father and mother, Thornton and Emily Spencer, join her as well, though her father sadly passed away last year. Other members of the Whitetop Mountain Band join too, like bassist Debbie Bramer and guitarist Ersel Fletcher, a retired coal miner from Glade Spring, VA. Other featured guests include renowned fiddler Billy Hurt, Jr, banjo player Alex Leach (Ralph Stanley II) and multi-instrumentalist Brennen Ernst. Rounding out the band in a surprising twist is Hank 3’s steel guitar player, Andy Gibson. It’s an all-star cast, many drawn together from all-night jam sessions, a hallmark of Appalachian music making.